In a craftsman style home, what width and milling of White Oak (quartersawn, rift, or plain) would most fit? 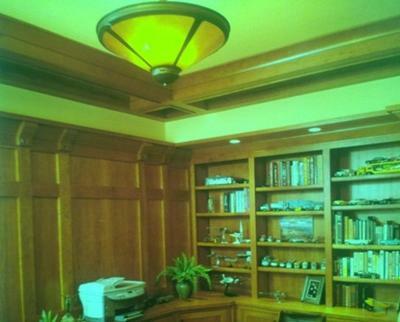 We are working toward a traditional craftsman style with several White Oak built-ins, a fireplace, and window seats. The kitchen cabinets are a lighter stained cherry with simple craftsman style doors. 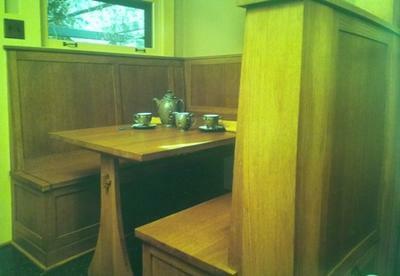 There is a built-in eating area (booth) on one end of the kitchen, also done in White Oak. The hardwood floor will cover the kitchen, family room (open to the kitchen in one large area), and dining room (separate room on the opposite side of the kitchen through a 4' open doorway. When, and if so, what type of border fits with a traditional craftsman style White Oak floor? We are considering a border around the perimeter of the dining room and possibly something to accent the fireplace in the family room. The ceiling in the dining room and family room will include a coffered section with darker beams framing the perimeter of the raised section and crossing in the corners. Should the border tie into the ceiling design? 2 1/4" White Oak, quartersawn, and quite clear. The Prairie School exhibit at the Minneapolis Institute of Art also has a clear, quartersawn, 2 1/4" floor, as I recall. I repaired the Maple floor of a south Minneapolis bungalow designed by Frank Lloyd Wright, but that, too, was 2 1/4" material, and very clear. I'm not sure what of my observations would be germane to the design sensibilities of architects like Wright, today. This humble floor guy, who hardly looks up, generally defines Arts and Crafts design as understated attention to useful detail. is its natural clarity, its straight grain. was probably specified by an architect to visually go away and NOT draw attention to itself. Cost is definitely going to be high, however, and you may flat out be told that the 2000 plus square feet you are looking for simply isn't available without considerable lead time. If a supplier offers Rift & Quartered as a more available option, follow up by asking the question, "Is it clear? You really need to see Rift and Quartered material before you order 2000 feet of it. There can be considerable variety in the color from board to board. than a Rift and Quartered White Oak that is only graded Select and Better. A uniform color will be most appropriate. As for board width, again, I don't know what Mr. Wright would say, today. Early 20th Century, 1 1/2" flooring was most common in the 3/4" thickness. So why do I personally only find 2 1/4" flooring from the same era in Craftsman Style Homes? Perhaps, the architects were interested in a more modern look. A departure from the norm. I would consider the year of original construction. Is this a vintage early 20th century house, or a 2001 house made to look a hundred years old? If the former, I'd pick the 2 1/4" board width, as long as the material is available in a clear grade. A 3 1/4" would be fine for a newer house. Wider than that, and I think the floor might start to lose that "understated" quality typical of craftsman design. This brings us to your excellent dining room question. A craftsman would definitely NOT miss the opportunity to tie the new floor into the ceiling beam design, as long as it is done so in an understated way. And, as long as the homeowner intends to leave the floor bare instead of covering it with a big beautiful Persian rug. Avoid the temptation to feature the detail, however, with an exotic pinstripe of some kind, or a darker stain. Simply replicate the ceiling pattern in the floor using the same species and grade as the rest of the floor. Same would go for the fireplace, which I'd love to include a picture of. Find a design element in the mantel and replicate with White Oak. I might have some other ideas once I see the fireplace, however. Here's to the longest life of your client's wood floor, and WillowRidge Construction, Anchorage, Alaska!